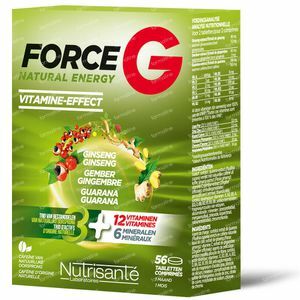 Nutrisante Force G Natural Energy 56 tablets order online. This multivitamin and plant complex helps restore energy and vitality when you're feeling temporarily tired or overworked. It also helps fulfil your daily vitamin and mineral requirements. The three plants – ginseng, guarana and ginger – provide a natural source of energy to boost your physical and mental performance. As a result, your body becomes more resistant and resilient, particularly during periods of stress and seasonal change. The six minerals – iron, zinc, copper, manganese, chromium and molybdenum – are all trace elements found in the body and are essential to a wide range of physiological processes. The 12 vitamins – A, D, E, C, B1, B2, B3, B5, B6, B9, B12 and B5 – provide 100% of the reference nutrient intake, to counteract any deficiencies in your daily diet. Vitamins C, B2, B3, B5, B6, B9 and B12 in particular help reduce fatigue. Meets the daily requirements in the event of a deficit. Shows resume in tone and vitality in cases of temporary fatigue or when overworked. Helps maintain the daily energy. 2 tablets per day with your main meal. Guarana contains caffeine and thus it's not recommended for children and pregnant women. Ginseng: 96 mg dry extract of which 11.5 mg of ginsenosides. Ginger: 60 mg dry extract of which 3 mg gingerols. 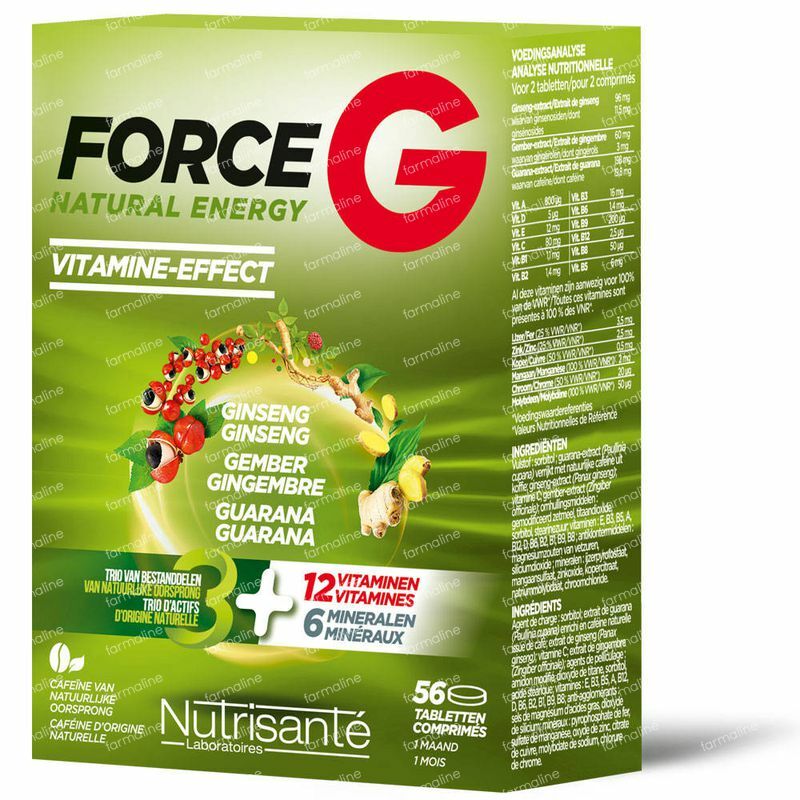 Guarana: 198 mg dry extract of which 19.8 mg of caffeine.